Today marks one year since Glenna, Noel’s mom, died. The first year was both brutal and beautiful, (or brutiful as Glennon calls it) for our family. I’ve been reading over the posts I wrote in the months following her death and I realized that I never mentioned anything about her dragonfly earrings which is a huge oversight. Before Glenna’s diagnosis, she ran an Etsy shop where she mostly sold earrings and cards. The shop was called True North which she defined as “not a geographical place, but that place we dare to venture and discover in our soul that feels right and good and at peace. It’s living each day in gratitude and finding joy in the journey no matter the twists and turns our path can take.” The shop itself didn’t make much money, it essentially paid for supplies and covered the cost of the multitude of items she gave away. She always carried a few items with her in case she ran into someone that needed one. She was known for putting a pair of earrings in the bank deposit canister for the teller or giving a zipper pull to a little child who needed some distraction. Every year she’d send me starfish earrings for the kids’ teachers along with a copy of The Starfish Story. Glenna used many different charms for her jewelry – pomegranates, ravens, compasses, lighthouses, trees, even shellacked moose poop – but after diagnosis she only used dragonflies. The birth of a dragonfly. Through the veil is how we progress. During the four months she lived with us, we gave away an abundance of dragonfly earrings and zipper pulls with a copy of her poem. Every nurse, doctor, and home health worker she deemed worthy (and it was pretty much all of them) got one. At first, Glenna made them. She would don her glasses and a headlamp to help her see and force her trembling fingers to thread dragonfly charms onto earring hooks. As her hands got more shaky and her concentration declined, I began making them for her. She was pretty much unconscious the last week of her life and didn’t really get to meet any of the staff that cared for her while she was at The Denver Hospice, but we knew what she would have wanted. I filled a gallon sized bag with poems and earrings and the family members that rotated through sitting with her made sure that every staff member that so much as checked her vitals got a pair of Glenna’s earrings and a copy of her poem. 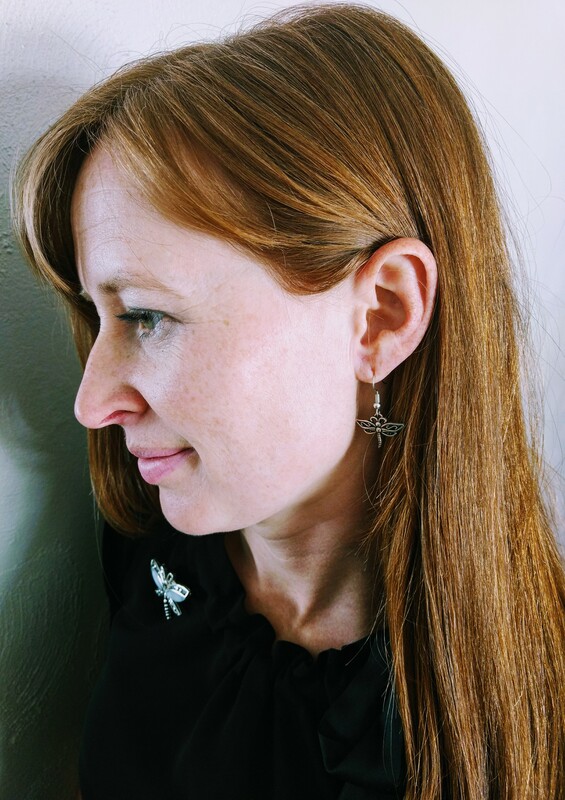 Today, I’m wearing my dragonfly earrings and one of her dragonfly pins. I wear them sometimes when I want to channel Glenna. They always remind me of two things: first, to look around and see how I can show appreciation for or encouragement to others, and second that all hardship, including death, is part of our progression. Beautiful Audrey. Thank you so much for sharing. Your words always say everything just right. What a beautiful analogy. I’ve been thinking about you guys this month and remembering your loss . Thank you for sharing some of your thoughts about it. It brought back memories of my mother in law. Thank you for your beautiful words!